Tent is a new protocol for distributed social networks à la Newebe. SàT has finally a real website! Sneer is a DSN you run on your desktop focused on file sharing. They introduce the concept of sovereign computing (sharing data and hardware). App.net is a social network where you pay to register, so they don’t need to sell your data. By the way, the author has some doubts about federated social networks. Diaspora launched a weird new project. Jappix project has a new website. Responsive Web Design is a book published by the well-known website a list-apart and is written by Ethan Marcotte. It is considered as a top reference by many, so I bought it with great expectations. About responsive web design, the main fact is that today your web applications can be seen on every kind of device or screens. So your UI should adapt to any of these. The layout is mostly concerned by this but other interactions (double click, right click, dragging…) should be considered too. By Fluid design, the author just means that you should avoid putting fixed size. Font should be described with em as unit instead of pixels and every width/margins/padding should be set with a percentage. You can eventually put a max width to your components if you don’t want them to become too wide. Then you should force your layout to fill the viewport. By the way, you can have a small sample on Cozy Cloud blog. Try to resize it to a small window and you will notice changes. A big part of the book is dedicated to the way of thinking responsive. The author gave us a nice table of common resolutions and situation you could met and. Then he tell us that a lot of people “think mobile first”. But the most interesting aspect is the concept of thinking responsive fully. When you write your responsive design, don’t think only “my website should be visible on small device”. Even if it’s a good starting point the problem is more profound than that : you don’t want to see the same content if you are on a mobile or on a desktop. For exemple, an event website will display location and informations first for small resolution (you check the page from a mobile) and will display pictures and place description first for big resolution (desktop). As you understand I really enjoy reading this book, but there is one bad point: the price is quite expensive for such a small book. 23 dollars + shipping is a little bit high for 150 small pages. Whatever, if you are interested in the responsive design and you require an initiation, this book will definitely do the job. If you need advanced informations about this problem, it would probably not be enough. It has been a long time since I wrote anything about books I read. 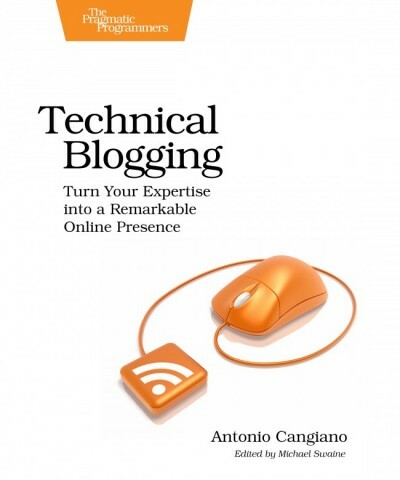 To break this, I will talk about Techncal Blogging by Antonio Cangiano, a book that explains how to manage your blog efficiently and how to market it. At the beginning I thought it was a book suited for blogs like mine but in fact not. It’s clearly a recipe book for people who wants to invest a lot of time in their blog. It encourages you to publish often and regularly and aims to bring your blog to a sustainable source of revenue. Whatever there are still some good remarks that can help you even if your blog is a small one. What I really liked with that book is that it really explains what technical peolpe are not good at: marketing. It proposes tons of tips for that like improving your blog titles, take advantage of communities (reddit, hacker news), exchange posts with other blogs… Another good thing is that it shows how to deal with post comments (how to react in fact). None of these tricks looks abusive, so I think they could be used safely. Finally it just pushes you to make something natural: interact with other people from your field. Of course there a lot more in this 250 pages book (how to configure your blog, how to make your blogging experience less time consuming….). Moreover, the author shares a lot of good links. As you guess I liked it and I recommend it to anyone who desires to blog intensively. Even non technical bloggers could be interested.